My Completely Objective STEEM PRICE ANALYSIS! Bullish! To the Moon! I have done extensive research on all things STEEM, and and have concluded that the price of STEEM is bullish. It is showing clear indications of going "to the moon", as they say. As we can see here, the price of STEEM is forming what is a very clear, classic "bull" pattern. You can almost see the bull. The price, as we speak, is literally pointing to the moon. Never mind the bear. Everything about the price looks awesome and we're going to be rich, but if you invest and don't end up rich, don't blame me. 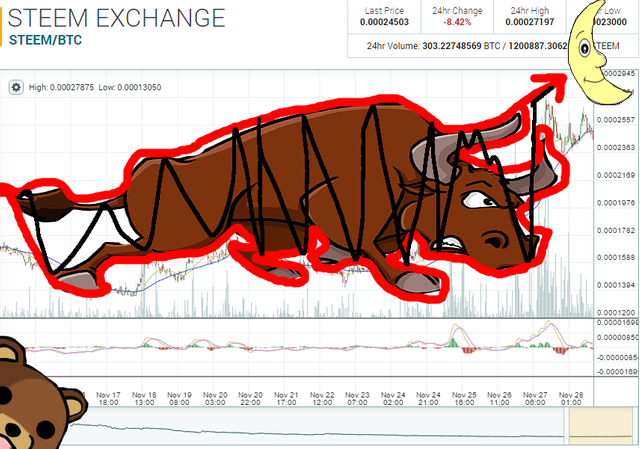 Right now, the price is undoubtedly bullish, as illustrated by my graph, but tomorrow the price can either go up, or down. Depending on factors. I have a strong feeling it will go either way tomorrow. We can determine that by looking at STEEM's historic ups and downs, and the fact that they have occurred. So, there's little doubt that things will occur tomorrow, as well. My tarot cards and chicken bones gave the same predictions. This post has been ranked within the top 50 most undervalued posts in the second half of Nov 28. We estimate that this post is undervalued by $12.06 as compared to a scenario in which every voter had an equal say. See the full rankings and details in The Daily Tribune: Nov 28 - Part II. You can also read about some of our methodology, data analysis and technical details in our initial post. Let's hope we are moon-bound! Upvoted. 'Tis a thing of beauty, well done. yep we are going up. I have never seen prices go to the moon, so I am not convinced. Not saying its not possible, but it would be a first. I have seen a TV show about people going to the moon, back in '69, but I don't recall any prices, or any bulls... or bears for that matter.